Baietan is located across the Pearl River in the southwest part of Guangzhou’s Old Town. It contains two major industrial uses (a steel mill and a shipyard) that will be relocated in the near future, and several urban villages. 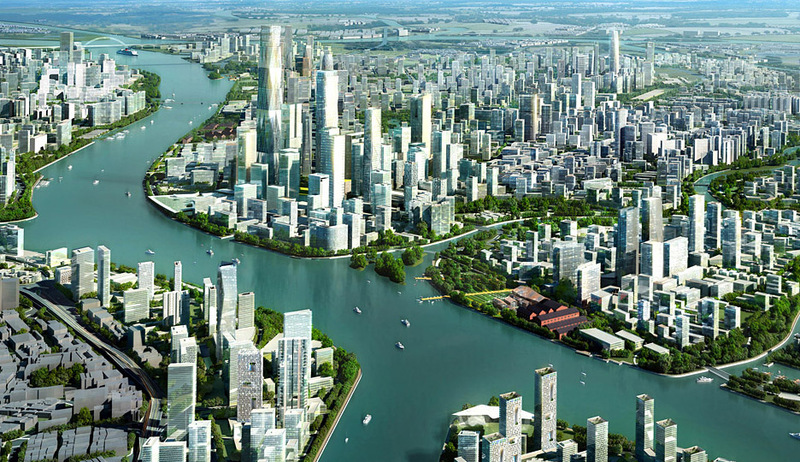 The City of Guangzhou wishes to develop this area into an exemplary, sustainable development in China. The project includes assessing strategic market needs, establishing sustainable goals and principals, urban design objectives, an overall master plan, and a transportation plan responding to sustainable goals. The Master Plan establishes a vision for the entire project site of 35 sq. km (22 square miles) and provides a detailed plan for the 4-sq-km Phase I project area. CHS Consulting Group, working closely with the SOM design team, was responsible for developing a multi-modal transportation plan. CHS worked with the Guangzhou Transportation Research Institute on future travel demand forecast, and used the data to develop an overall roadway and transit networks. Based on the estimated traffic volumes and transit ridership, CHS suggested changes in the City of Guangzhou’s proposed subway network, extension of additional transit lines to serve Baietan, a rapid bus network including roadway cross-sections appropriate for BRT operations, and bus stop spacing for BRT and non-BRT buses. CHS developed a pedestrian and bicycle network designed to minimize traffic generation. CHS also provided suggestions on the appropriate level of parking supply to support sustainable development goals. This project received a 2011 AIA San Francisco Chapter Urban Design Merit Award.